Skin rashes are one of the common drug-induced reactions which usually becomes evident within days or weeks of starting a medication. It is an adverse reaction to the presence of the chemicals in the drug. It can either be allergic or non-allergic. This meas that the drug triggers the immune system which then causes skin irritation (allergic) among other symptoms. At other times the skin rash is occurring through other mechanisms without eliciting abnormal immune activity (non-allergic). There are various types of skin rashes that may arise with using different medication. It is however not always possible to ascribe a certain skin rash with a specific drug. Instead an adverse drug reaction is considered as a possible cause of the skin rash when it starts shortly after commencing a certain medication or there is a history of adverse drug reactions to a specific medication or class of drugs. The reasons why skin rashes may occur with using certain drugs can be discussed under drug allergies or non-allergic drug reactions. It may not always be possible to immediately identify the reason of a skin rash as a result of a drug reaction without further diagnostic investigation. Immediate hypersensitivity (type I allergic reaction) is when certain drugs reacts with specific antibodies already in the body. This triggers mast cells, a type of immune cell, to release large amounts of substances like histamine. The reactions may cause symptoms that lead to mild discomfort or can be very severe and even life threatening. Immune complex reaction (type II allergic reaction) where the drug causes a chemical alteration on the surface of some cells. The immune system produces antibodies against these alterations (antigens) and immune cells then destroy the body’s own cells. Delayed hypersensitivity (type IV allergic reaction) where the reaction appears after a period of time. T-cells and macrophages target the antigen directly rather than antibodies. Chemical mediators of inflammation are released in the process which causes tissue injury. Aggravation of an existing skin condition. Drug interaction is where the drug is affected by another substance in the body, possibly even another drug, to elicit an adverse reaction. Drug overdose is the accumulation of excessive quantities of a drug in the system either because it is consumed in larger than prescribed doses or the body is not eliminating it at the expected rate. This may be accidental or intentional. Disturbance of the skin flora where the population of the bacteria or fungi that are normally found on the skin are altered in a way that allows for other skin diseases to set in. Idiosyncratic drug reactions are where unexpected effects are yielded from a drug that is not in accordance with the known effects or side effects. Pharmacological effect is the expected and usually desired chemical effect that the drug has on the body. Phototoxicity where the drug renders the skin hypersensitive to light, particularly sunlight. Acne-like rash – anticonvulsants, corticosteroids, lithium, oral contraceptives and TB drugs. Pink to red pimples with scaly skin – ACE inhibitors, antibiotics, anticonvulsants, antithyroid drugs, barbituates and NSAIDs. 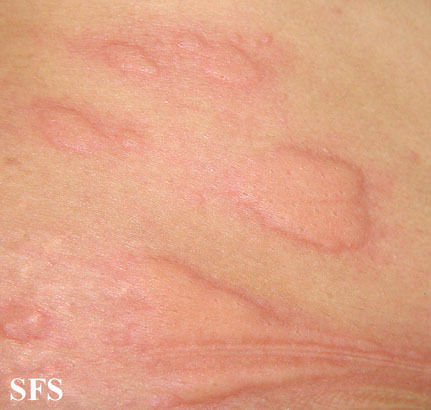 Red raised rash with a flat top – antibiotics. Painful rash with purple spots – NSAIDSs like indomethacin, oral contraceptives, phenytoin and sulfa drugs. Skin peeling and redness – gold drugs and TB drugs. Fluid filled blisters with skin redness throughout the body – various antibiotics, oral antifungals and antimalarial drugs. Round red rash which leaves darkened patches – antibiotics, barbiturates, quinine and sulfa drugs. Psoriasis-like rash – lithium, beta-blockers and anti-TNF drugs. Abnormal skin discoloration (pigmentation) – gray (amiodarone, minocycline), brown (bleomycin, busulfan, psoralens), red (clofazimine), yellow (mepacrine) and a bluish tinge (chloroquine). Sun rash (not sunburn) – antibiotics like tetracycline, sulfa drugs, thiazide diuretics and phenothiazines. Sourced from Dermatology Atlas (Brazil) courtesy Samuel Freire da Silva, M.D.